-Lowe’s hardware stores–hip hip hurray for hot handymen! -Starbucks–a latte and a love story? What could be better! -Bakeries–like Starbucks, only better because it involves high-calorie bites of deliciousness. YUM. -Malls–shop ’til you drop and then relax with a steamy read! -Gyms–I for one get a little nauseous reading and running/spinning/elliptical-ing simultaneously, but what a great idea! Yes, one hardy lady actually gave an officer who pulled her over copies of the book–and he LET. HER. GO. And then gave them to his wife, who Tweeted about it on our site! 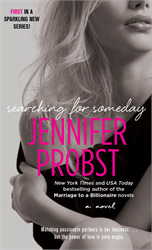 That’s the magic of Jennifer Probst, people. She’ll make you laugh, make you cry, AND get you out of a ticket. There it is, front and center!